We are here again with some new products. Well, more like new beautiful packaging on some of their bestselling products. This Magnolia Collection package is just beautiful complex at the same time simple. I love the flower magnolia and mainly the smell of magnolia. The flower smell is quite heavy, but never sicken. 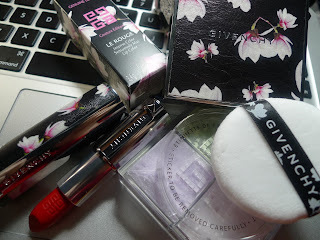 (maybe just for me) Givenchy products are quite amazing in general, so with the great package, i love it even more. They only have 2 product for this collection, but it is 2 very useful products that its a great fit for everyone that wears makeup in general. Givenchy Prisme Libre Magnolia Couture Edition "Mousseline Pastel": This is the Mattifying and Color-correcting loose powder. Combine the 4 shades into 1 perfect harmony! Its a sheer and luminous powder thats able to set your makeup in place for a long period of time. Very lightweight, refreshing and soften the complexion for a radiance luminosity makeup look. This is a fantastic powder for ones with an oily, dull, tired looking skin. You can control the oily t-zone and get the luminosity that will make you look awake and fresh. While color-correcting for luminosity, you don't have have the need to go in with a heavy highlighter while in a hurry. (we all know how that ends, but highlight away if you want, its makeup, it wash off at the end of the day) Even if you can't get the one from this collection, it is still available for purchase from their regular line. Givenchy Magnolia Couture Edition Le Rouge "306 Carmin Escarpin": Another red lipstick just added to my collection. 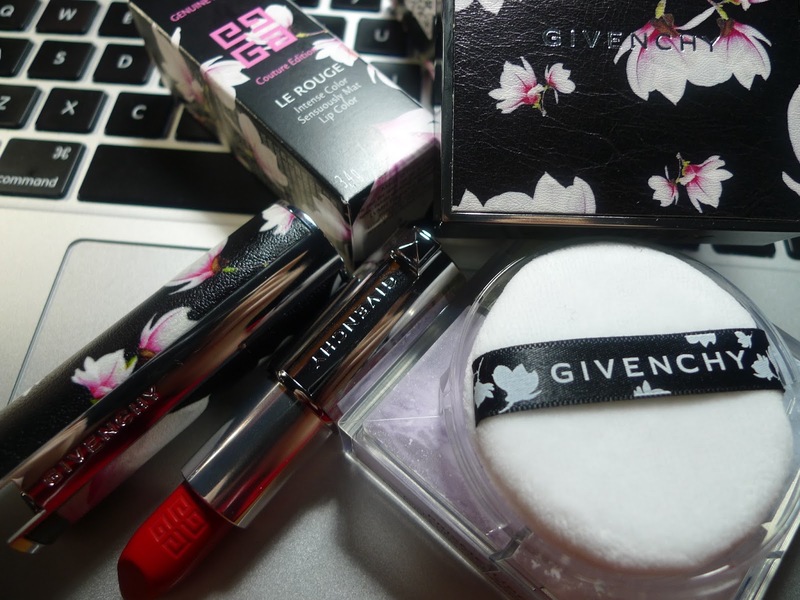 This the Givenchy's signature Le rouge lipstick with the leather package. Its a rich-semi-matte that is both creamy and lightweight, Also, radiant, ultra-smooth and non-sticky texture glides on softly and coutures the lips. This is a true red with a bit of orange undertone, which at first i thought that would look weird on me. 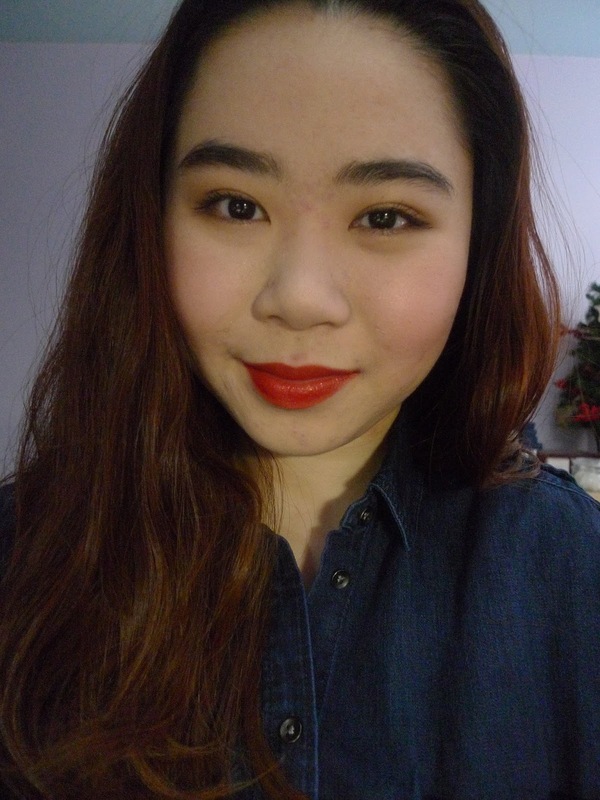 After wearing it a few times, I think that i quite like this color and it would suit lots of different skin tone. Even if you don't like this color, they have a wide range of color on this line that may suit you better. Overall, these are amazing products with beautiful designs. Its not that affordable that everyone is able to get their hands on it, but its also not too expensive that you will be eating instant noodle for a month. With the beautiful magnolia design and its amazing quality, who can resist. Only the design of the package have been change. The cap for both product can also be use on their regular line. So when you finish with the powder or the lipstick, you can always reuse the caps again for the new products and with this beautiful magnolia design, who wouldn't like this on vanity for this display. Get your hands on this collection while you can! Hello, thank you soon much for reading and comment on my blog! You are the first person to comment on my blog and I really appreciate the support! I will check out your blog as soon i finish this comment. I would love to do collab together! My email is Octoberloveinnyc.com, we can chat more about it. Thank you again for the support! Everything you see on this website was created by OctoberLoveInNYC (Haishan Wu) unless state otherwise. Please do not use any photos or content without asking permission ahead. Majority of the products mentioned on this site are my own purchase. Any sponsor product/content or affiliate links WILL be clearly stated in blog post and/or around content. I only recommend products that I genuinely AND honestly recommend but I can’t guarantee everything will work for everyone.